Neonatal ICU, Dept of Pediatrics. Dept of Radiology. Vydehi institute of medical Sciences and research centre.Whitefield, Bengaluru Phone no : 080-28413385-89,Ext-273. Air leak syndromes are a group of clinically recognizable disorder produced by alveolar rupture and subsequent escape of air in to the tissue in which air is not normally present. All the clinical types of air leak syndrome originate in over distended alveoli, which ultimately rupture. Over distention is because of spontaneous vigorous respirations (usually larger team babies) at birth, increased pressure of mechanical ventilator (PEEP, PIP) vigorous Cardio Pulmonary resuscitation, air trapping in the presence of a ball valve mechanism, most of this air leaks occur spontaneously, but incidence increases with ventilator support. Incidence of these problems depends on severities of disease, gestational age, mode of therapy, experience of personnel handling baby and machines. Most frequent during treatment of RDS and meconium aspiration syndrome. All air leaks are caused by High Intra Alveolar pressure, because of retention of air or High volume flow. Then pressure gradient from affected alveoli to adjacent tissue space will alter that causes rupture of alveolar base that overlie capillaries. Air escapes through capillary sheaths. Which is disrupted, called PIE (Pulmonary Interstial Emphysema) then air travels through (Dissects) Perivascular sheaths and migrates towards hilum (called Pneumo mediastinum). Later air enters to pleural space through dissecting visceral and parietal layer reflection Pneumothorax). If it enters to pericardial reflection where pericardium and visceral layer attaches at Hilum. Sometimes after Alveolar rupture air enters through trabacular spaces enters the visceral pleural space and causing blebs (Pseudo cyst). If air collection increases and it ruptures and causing pulmothorax. If air leaks from hilum (pneumomediastinum) to upper portion of body (neck) through vascular sheaths, if enters down wards through peri vascular sheaths of great vessels and Esophagus into retro peritoneal space. (Retro peritoneal emphysema). Later if posterior peritoneal cavity ruptures it enters to peritoneal cavity (Pneumo peritoneum). If it dissects into process vaginals it causes Pneumo scrotum. Some times if Alveolar rupture directly into pulmonary vessels it causes Air Embolism. Another possible pathway involves the dissection of air through the subadventiatial planes of Pulmonary veins thus producing both air embolism and Pneumo pericardium. Pneumothorax and Pneumopericardium require immediate treatment otherwise death or brain damage may occur. Some times Pneumoperitonium also require immediate drainage otherwise may cause portal veins compression and decreased venous return to heart. Over distention of distal airways,(alveoli, terminal sacules or bronchioles).if it ruptures air leaks into connective tissue sheaths that envelop the airways and accumulates causing PIE. Most common in small size babies, who needs mechanical ventilation. Clinically baby needs increment in oxygen and CO2 (carbon dioxide) accumulates. Then air interferes in between alveoli and capillary causing O2 & CO2 exchange defect (V/Q mismatching), gradually air compresses the Capillaries and hilum causing decreased venous return so metabolic acidosis set in. Then needing increased ventilator pressure, it attributes once again increased lung volume (Non complainant Lung), causing pressure effect on heart eventually death or IVH (Intra ventricular Hemorrhage). In one study all Pneumothorax babies had PIE. If PIE develops within 24 hours of life, among these infants later majority developed BPD (Bronco Pulmonary Dysplasia). Diagnosis only by radiological images. Two basic features noted in radiolucencies. (1) Linear type (2) Cyst like. The linear Radiolucencies vary in width, coarse in nature, they do not branch, seen in peripherals as well as medial lung fields. [D/D for Air bronchogram(RDS) It is branching starts in hilar region mainly towards lower lobs].CYST like radiolucencies size vary from 0.5mm to 4mm. Sometimes so coarse it looks like spongy type [D/D PULMONARY Hg]. Treatment is mainly decrement in PIP (Peak inspiratory pressure) Inspiratory time, PEEP (Positive End expiratory Pressure) and place the affected lung down ward side. Ex-.left lung PIE –left lateral position or selective intubation that means if left lung is affected intubate in RT main bronchus or individual lung ventilation technique. [Master & slave ventilation]. Ultimately the best results we get from high frequency oscillatory [HFO] ventilatory support. It usually resolves the PIE with in 24-48hours. By decreasing tear & shearing forces of PIP and tidal volume.100%O2 supplementation washes out nitric oxide leading to alveolar& interstitial atlectasis and helps in preventing further air leakage. Usually occur in small RDS babies or post mature with meconium aspiration babies with vigorous resuscitation at birth or on mechanical ventilation. Usually asymptamatic, sometimes causes abnormal clinical signs tachypnea, bulging sternum, muffled heart sounds, cyanosis according to severity of air collection. Radio logically [chest X-ray A_P view] sometimes normal if more air collected it lift thymus(bat-wing, angel-wing sign). It is triangle in shape, if more & more air is collected it lifts the thymus and air border below it extends to lateral side of thorax. [spinnaker sail sign]. Pneumothorax can occur spontaneously or with assisted ventilation and aggressive CPR. Spontaneous Pneumothorax usually occurs during the first few breaths soon after birth. In this group, babies are usually asymptamatic only 0.05 % are symptomatic and noted in full term and post mature babies. We have seen spontaneous Pneumothorax in meconium aspiration, RDS, Transient tahypnoea (RDS type II) Pneumonia, Pulmonary Hypoplassia, Diaphragmatic Hernia. Clinical picture starts in labour room or immediately after birth (during observations) as tahypnoea (RR= > 100) decreased air entry on affected side, bulged chest wall, grunting, retractions, cyanosis in room air. If air collection increases cyanosis is more evident even with Oxygen. ECG Voltage tracings in monitor decreased in size. 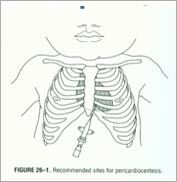 Tension Pneumothorax is common in ventilated babies; Produces abrupt cyanosis decreased heart rate, BP, Metabolic acidosis. Shifting of mediastinum. When baby is on ventilator if Pulmothorax is predicted (increased ventilator pressure, LBW, sever RDS, after surfact therapy) trained Nursing staff and Doctors presence is essential to prevent and tackle the problem. In some studies Pneumothorax followed by some amount of PIE or Pneumo mediastinum is very evident. Clean the area of affected chest where we are going to place ICDT. Connect to under water seal, suture the site with silk and secure the ICDT/ dressing is must with plaster holding the ICDT tube. After air column is stopped moving or water column oscillation stopped oscillating clamp the ICDT, wait and watch for cyanosis or SPO2 dropping. If dropping of SPO2 seen or cyanosis noted. Remove the clamp, other wise wait for 24 hours take chest x-ray if no air is accumulated remove ICDT close the insertion site with gauze and immediately suture the wound to prevent air entering the pleural cavity from outside. If wound dressing is not done properly that might be the source of infection. Usually associated with other air leak syndrome and occurs in babies on high ventilator settings. Clinically if mild Pneumo Pericardium present it may be asymptamatic, if it increases sudden cyanosis and it is deepening and causing decreased Heart rate, BP – Peripheral pulses not palpable, metabolic acidosis all these features are because of air compressing the heart and causing decreased stroke volume. On examination Heart sounds are muffled. In ECG, Voltage reduction is evident in monitor graph. Diagnosis- Chest X ray of A- P view shows air surroundings the Heart borders. 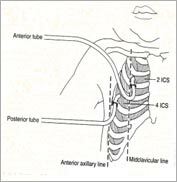 In lateral view Anterior and inferior border of heart separated by air column. Treatment – Usually- conservative management is enough if there is no cyanosis or sever symptoms, other wise needle aspiration or Catheter placement is necessary for continuous drainage. Advance the needle at 30 0 angle aiming towards the midclavicular line on the left. Free air in the Peritoneum usually because of perforation of abdominal viscera, which may requires drainage. But if the same time aberrant air in the chest suggests that the situation is non surgical. (In the absence of peritoneal fluid, normal bowel wall thickness or no abdominal symptoms or signs present). Patho Physiology of Pneumo peritoneum and retroperitoneal emphysema already discussed. Occasionally, massive Pneumo peritoneum may compress the portal, inferior vena cava and resulting decreased blood return to the heart, hypotension and metabolic acidosis. ( Intervention needed in the form of ICDT placement in the chest alone will resolve the problem, unless very severe Pneumo peritoneum may need drainage. It is very rare). Air in the blood circulation is called Air Embolism. Path Physiology of this incident already explained. Clinically baby can become sudden cyanosis, Circulatory collapse and if air enters any particular circulation Ex- brain, lungs, Kidney etc. Infraction can occur. Heart Rate decreases and with each heart beat air- blood mixture crackles and pops out into systemic circulation. 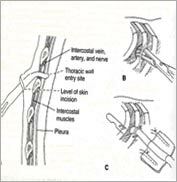 When blood is drawn from Umbilical artery catheter, it yields alternating segments of air and blood. Treatment – 1. Conservative management is the only treatment present.